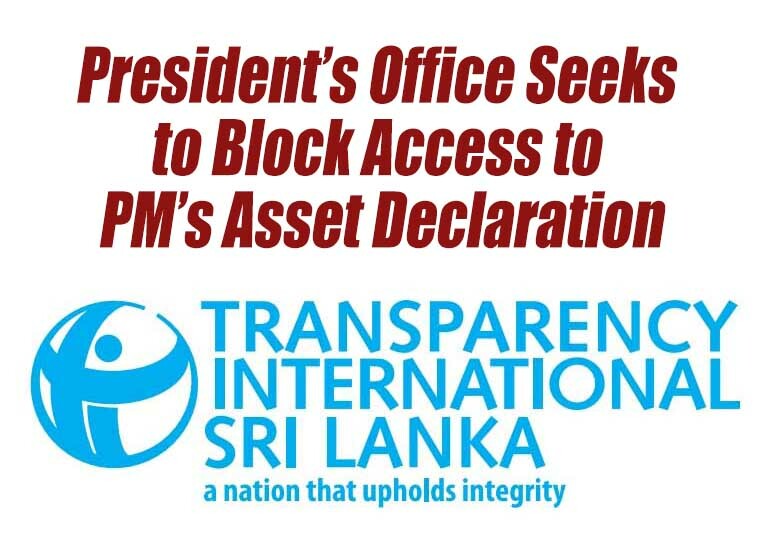 (Lanka e News - 07.Jan.2019, 11.00PM)) Transparency International Sri Lanka (TISL) is disappointed to learn of the decision made by the Presidential Secretariat to appeal against the order issued by the Right to Information Commission (RTIC), directing the disclosure of Prime Minister Ranil Wickremesinghe’s assets and liabilities declaration for 2015/2016. TISL’s Executive Director Asoka Obeyesekere said, “Given the President’s New Year pledge to fight corruption in 2019 and given the allegations cast against the Prime Minister in late 2018, we are surprised that the President’s Office has sought to block access to the Prime Minister’s Asset Declaration. Having credible self-declared information in the hands of the public is an essential ingredient presently missing in the fight against corruption”. The initial applications for the asset declarations of the President and Prime Minister were filed in February 2017. The President’s Office had refused to disclose the information requested, prompting TISL to appeal to the RTIC. In its historic ruling the RTIC underscored that “the RTI Act enables a powerful check to be exercised on even potential corruption, as this would deter those otherwise enticed to amass public wealth for themselves”. In our statement following the Commission’s ruling, TISL recognized the right of the Presidential Secretariat to appeal the RTIC’s order. TISL also highlighted the fact that such a challenge would undermine the President’s stated commitment to transparency and accountability, and the government’s commitment to ensure the public’s right to access asset declarations. Obeyesekere added, “as many members of parliament have repeatedly expressed a willingness to unilaterally publish their asset declarations, TISL calls on all elected representatives to proactively disclose their asset declarations to foster a culture of accountability and open government”.